I am already anticipating a mob of angry people reacting to this headline, so let me start with this: Pinterest is not bad. In fact, it can be pretty wonderful. I’m as guilty as the next person of getting lost in time, clicking and pinning and planning and thinking. I have inspiration boards for clients’ logos, customer service campaigns, my daughter’s forthcoming wedding, ideas for handmade jewelry and organization projects, and (of course) recipes. I have boards of books to read and writing tips and inspirational quotes and prayer journaling. It’s a great source for inspiration and ideas. It’s all good and fine. Unless it isn’t. And you’re the only one who can judge that. Hear me out. I don’t mean to pick on Pinterest here. 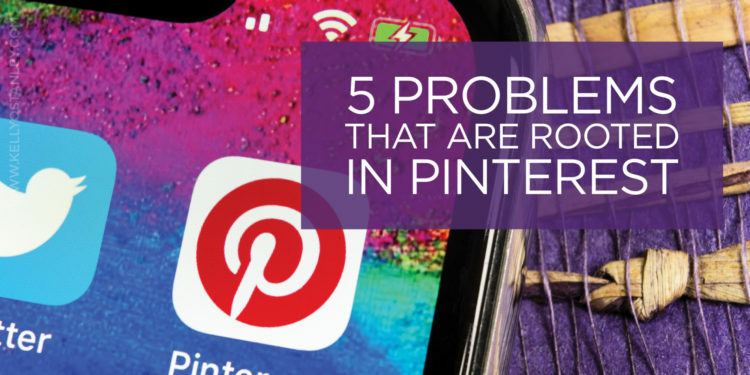 Much of this could be applied to any social media or online pursuit, but Pinterest’s very nature makes some of these potential problems more likely. As you read, ask yourself if you’ve let any of these five aspects get out of hand. And then ask God to help you restore balance in your life. 1. Pinterest makes it easy to compare ourselves to others—and believe we don’t measure up. We are to establish our identity in Christ, not base it on others’ opinions. But when we spend enough time online, we may feel we don’t measure up in real life. Those perfect birthday parties? I don’t have time to make an elaborate cake, personalized invitations, themed party games, and take-home goodie bags filled with healthy, nutritious, delicious and beautiful snacks. So I may feel as though I’ve cheated my child, and carry around guilt that doesn’t do me nor my child any good. Or I may feel dislike for others who seem to be outshining me. The reality, though, is that I was fine until I saw what everyone else (supposedly) is doing. And perhaps the only reason I burned our dinner tonight, showing I don’t fit among the ranks of the world’s chefs, was because I spent too long scrolling through the picture-perfect “quick and easy crock pot meals” board. 2. Skewed expectations for ourselves may lead to unnecessary, unwanted pressure. When I think what I see online is “normal,” not only do I feel as though I’m not as competent or accomplished as everyone else is, but it may lead to setting outlandishly high, time-consuming goals for myself. When they serve to motivate us, goals are beneficial. But when they cause us to continually strive (rather than learn to rest in our identity as a child of God who can never “earn” favor), unrealistic goals will just lead to disappointment. When rooted in a desire to compete, rather than being founded on God-given direction for our lives, outlandish goals gobble up time that could be better spent on other pursuits. 3. Dwelling on picture-perfect, Pinterest-perfect lives may lead to dissatisfaction with our own. So many people have dream home boards (myself included), which can make me long for a bigger, prettier, more expensive house. Fashion boards, showing expensive clothing on unhealthily thin models, tempt me to overspend so I can look better (or under-eat to fit into that dress). Screen after screen filled with picture-perfect family portraits, creatively orchestrated and perfectly coordinated, makes me jealous of the family who doesn’t have anything better to do, and who has the time and money and ability to coordinate the whole family’s schedules to make it happen. Each of us has our own insecurities, so what bothers me may not faze you, and vice versa. But when we’re saturated with the ideal instead of focusing on reality, we’ll feel disappointment with our lot in life. 4. Showing off your material blessings—or presenting yourself as someone who’s “all that”—is rooted in pride. When I go online, I get to create the impression people will have of me. If I post Bible verses and photos of my coffee mug sitting next to an open Bible, people will think I have a strong faith life. If I post lots of child-rearing tips, healthy recipes, and sappy family pictures, people will think I’m a good parent. Trying to make yourself appear to be something you’re not is not good for you, and it’s not helpful for all those who will see it and think they can’t measure up. 5. Using Pinterest (or Twitter or Facebook or Instagram) too much may be a way to avoid real life. One thing I’ve learned about myself is that when I spend hours browsing in a Christian bookstore (or on prayer boards on Pinterest), it’s often rooted in a hunger to go deeper in my faith. But because I am human, I will spend all the time I could have used to finish that Bible study or start that prayer journal by reading about different ways to do it, studying tips, gathering supplies, and so on. Losing yourself in the world of Pinterest—even when it’s a wholesome or positive topic—can be a sign that you’re avoiding the real world or simply a distraction that keeps you from getting anything productive done. If finding those housekeeping tips enables you to spend an extra 20 minutes reading your child’s favorite book, or gives you time to take a stress-releasing walk, then thank God for Pinterest. But if you’re viewing life as nothing more than a stage for you to create the perfect post, you probably need to reset your thinking and try to live in the moment, enjoying the life you’ve been given. If you see yourself in any of the problems above, try these three simple tips for maintaining balance. Don’t give time to Pinterest that you can’t afford to lose. If you know that you lose track of time when browsing, set a timer. And then go back to interacting with actual people in your actual home in whatever flawed and authentic manner you’re able to do. …when you find yourself intimidated, discontent or envious. This may mean you need to take a long break, or maybe just come back tomorrow when you’re rested. Dear Lord, we are fortunate to have all of these luxuries and technology, including access to Pinterest and the leisure time to spend using it. Help us use it for the right reasons—to enhance our lives, not disrupt them. To offer inspiration (not unattainable perfection) to others. To simplify, not complicate. To be inspired and motivated, not be distracted from what matters. Forgive us for all the ways we allow the priorities in our lives to be unbalanced, and help us keep our sights and priorities set on You. Because You never fail. You never judge or envy or condemn us for failure. And unlike anything else we’ll ever see, You alone are perfect. Amen.